When Washington dismissed center Robert Upshaw, the Huskies lost their best player -- and best chance at making the NCAA tournament. Stefan Nastic went left. He went right. He went up, then under. And Wednesday night against Washington, the Stanford center showed just how easy it’s going to be to go around Washington’s interior defense the rest of the season. When news hit late Monday that UW had dismissed junior center Robert Upshaw for an unspecified violation of team rules, there’s no doubt coaches around the Pac-12 threw small parties in their offices. Not because they’re excited a troubled kid has been kicked to the curb, but because Washington (14-5, 3-4) just got a lot more beatable. Don’t be fooled by the fact that Upshaw, who averaged 10.9 points, 8.2 rebounds and a nation-leading 4.47 blocks, came off the bench for the Huskies: He played 25 minutes a night, and Washington’s postseason hopes rested heavily on his broad shoulders. Three Pac-12 teams have already locked up spots in the NCAA tournament: Arizona, Utah and Stanford. With Upshaw, the Huskies had a good shot at becoming the fourth. Without him, they’re in trouble. And Lorenzo Romar knows it. Understand that the 7-foot Upshaw did more than reject opponents’ attempts; Upshaw changed every defensive possession for UW. Post players were rendered useless against Washington, because Upshaw was so big and so commanding a presence that other teams often avoided the paint. He’s a huge reason why the Huskies entered Wednesday night second in the conference in defensive field goal percentage at 36.5 and fifth in the country at two-point defensive field goal percentage. In their 84-74 home loss to Stanford, however, Nastic finished 8-of-11 from the field with 17 points while the Cardinal connected on 52 percent of their attempts. Get used to more numbers like those. Someone else will be able to make up for Upshaw's scoring and rebounding. Romar anticipates leaning more on Shawn Kemp Jr., a 6-foot-9, 280-pound senior who averages 10 points and four boards in 26 minutes per game. Offensively, Washington will be able to spread the floor better and not worry about a lumbering Upshaw getting in the way of an attacking guard. But the Huskies don’t have anyone who can replicate his defense. Blocking and altering shots takes special skills and size. Upshaw was the only player on Washington’s roster with that unique combination. The Huskies have another 7-footer in junior Gilles Dierickx, but he has played only three games this season because of a lingering foot issue, and the eight minutes he logged against Stanford were a season-high. Romar said that Dierickx is finally healthy but still working to get his timing back. “He will get his opportunity, no doubt,” Romar said. What he didn’t add: Dierickx has never been more than a role player for UW. Jernard Jarreau, listed at 6-10 and 240 pounds, plays 22 minutes a game. He’s not the answer either. As a result, UW's NCAA tournament hopes are all but over. And that’s bad news for Romar. Give Romar credit for dismissing Upshaw, at least. Going into his 13th season with Washington, there’s been chatter that Romar’s job is in jeopardy. Ten years ago, he led the Huskies to 29 wins, including the Pac-10 tournament championship, and earned a No. 1 seed in the NCAA tournament. To the team's fans, it probably feels like 100 years ago. Washington has had plenty of pro talent the last few seasons -- Suns point guard Isaiah Thomas and Raptors forward Terrence Ross among them -- but for whatever reason, Romar can’t mold it into deep NCAA runs. In his 12 seasons in Seattle, he’s never been able to get past the Sweet 16. Romar had four consecutive 24-plus win seasons from 2008-12, but the Huskies then slipped to 18 in 2012-13 and 17 last season. Washington hasn’t been to an NCAA tournament since 2011. It’s easy to look at those numbers and see that his program is regressing. Many coaches would keep a troublesome standout on their roster if that player could help save their job. Romar could have done the same but chose not to. Unfortunately for him, integrity alone won't keep him in Seattle. Only winning will do that. 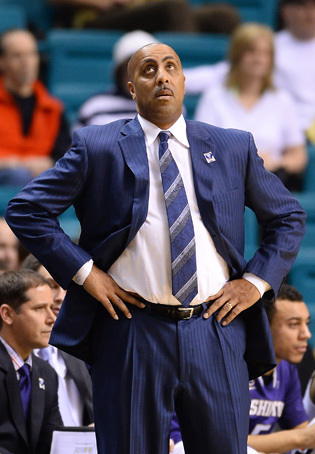 Romar is still a good coach, and he hasn't lost his teaching ability. But in an increasingly difficult Pac-12, a climb back to the top could be brutally tough. This is Arizona’s conference. Utah has finally arrived. Stanford, in tatters two seasons ago, looks to have hit its groove. Oregon has been to the last two NCAA tournaments, and Oregon State is on the rise. The margin of error is small and without Upshaw, the Huskies might have run out of room. Firing alums -- Romar was a two-year starter for the Huskies from 1978-80 -- can be uncomfortable, but it might be necessary if the Huskies can’t salvage their season. After starting 12-0, then-No. 13 UW lost at home to unranked Stony Brook on Dec. 28. They’ve yet to fully recover. Doing so without their best defensive player won’t make it any easier. On Tuesday Yahoo’s Adrian Wojnarowski reported that Upshaw was going through the agent process and might jump immediately to the NBA's D-League. His size and skills should translate to the next level, where DraftExpress.com has him going No. 19 in its latest mock draft. There’s a chance that while the Huskies watch March Madness from their couches, Upshaw will already be counting his money as a pro. In the meantime, the scouting report on Washington is clear going forward: Attack the rim. There’s a lot more room around it now.